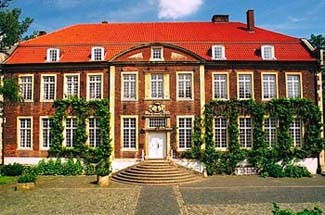 The first documentation of Schloss Wilkinghege dates back to 1311 as a property belonging to the von Rhemen zu Barensfeld family. Like many Westphalian castles, a moat provided the castle’s best defense. The use of brick is typical too, as stone was not as readily available. The Renaissance style you see today is attributed to the Steveninck zu Broich family, who rebuilt the castle in 1550. Look for the two lions on the crest over the entrance. The rooms in the annex, which was a former stables and pheasant house, are modern in decor. I would opt for the rooms inside the mansion to experience the hotel’s historical ambience at its best. Münster is well served by train and bus. Schloss Wilkinghege is more of a mansion than a fairy tale style castle, although a surrounding moat gives it just the right romantic touch. The mansion’s tastefully decorated interior with stuccoed ceilings, silk tapestries, period furniture, old paintings, and engravings suggests a late Renaissance style with enough modern updates for comfort. Guest rooms inside the mansion are spacious and include period furnishings. If you ask for a room in the back, you’ll have a view of the moat and surrounding countryside. The schloss’s restaurant is highly rated, and when the weather is fine, you can enjoy eating outside on the terrace. A lovingly tended formal garden helps lend to the tranquil atmosphere.